It can be hard to dispel a myth. Sometime advice sounds reasonable, or we are so use to an idea because we have heard it all our life. But occasionally the truth shows that some beliefs are myths. Only sugar causes tooth decay. Sugar is definitely bad for teeth and general health, and we tend to eat far too much of the sweet stuff. But any starchy foods can cause the same type of decay problems. And anything acidic, like lemon or fruit juice, is almost as bad. The bacteria in our mouths turn all sorts of food into decay causing acid. Sugar and starch are the worst of the lot. We should brush out teeth straight after eating and drinking. This was thought to be true, until research showed that many foods and drinks would weaken the tooth enamel. This means that the brushing would wear the tooth away! The teeth became sensitive as the enamel became thin. Wait 30 minutes after meals before brushing teeth. In the meantime it helps to drink water or chew gum. Diet drinks are a healthier option. Most diet drinks are still acidic, so they will damage teeth pretty badly. And at least some artificial sweeteners are bad for health. There are adults who straighten their teeth with braces, or perhaps invisalign. It is just as effective. The advantage of using braces as a teenager is that your teeth will be straight by the time you are an adult, so you can enjoy them for the rest of your life. Water is definitely healthy. It cleans teeth and keeps us healthy. But bottled water has one small disadvantage is not containing fluoride. The fluoride in tap water helps reduce tooth decay. If the local water supply is good (as it is on Sydney) then tap water is a good reliable option. Women lose a tooth each time they have a child. This is not literally true, but there is a certain poetic truth in this. Pregnancy does strain the health. So in older generations many women tended to lose teeth for this reason. But modern dental care can largely prevent this. A neat appearance tends to go with good functionality. Neatly aligned teeth will make chewing and speaking easier, and tend to be free from jaw pain. They are almost always easier to clean. 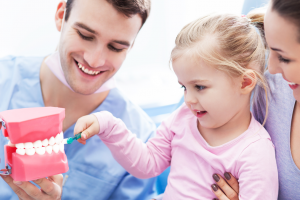 Decay in a baby tooth increases the risk of problems in the permanent teeth. Keep the baby teeth healthy. Any understanding of aesthetics will discuss the idea of coherence – all the parts of an object or artwork must fit together to create the right overall impression. This is true whether the parts are meant to be pleasantly balanced (which is the usual case) or if they are deliberately meant to clash. All the elements of an attractive object or artwork may contribute to the overall effect. Sometimes changing one element we change that overall effect; one element can make or break the end result. On the other hand we occasionally find that changing element of the whole makes no different. Changing one element will make no difference if all the other elements were not quite right to start with. There are various elements of a mouth and its smile. All contribute to the overall effect. The tooth colour is most noticeable when something is wrong. We expect teeth to be bright white, and associate this with cleanliness. 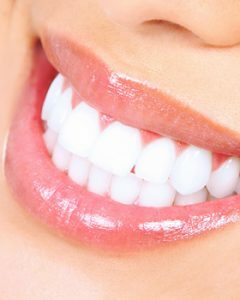 Bleaching can make dull looking teeth a very nice shade of white. The curve of the teeth. The row of teeth will usually look most pleasing if they gently curve upward. We usually show some gum line with our teeth. Too much gum can look unbalanced. But having a smile that is all teeth can also look unbalanced. Teeth look best when evenly spaced, almost touching with no gaps. Our culture expects the upper teeth to be slightly more forward then the lower teeth. This is a very mild overbite. This alignment can be altered with orthodontics. The front teeth should be in the centre of the face, though slight asymmetry does work well for some people. Orthodontic treatment, including braces, will straighten teeth. This is especially effective when done in the teenage years as the patient will benefit from the improved teeth for their entire adult life. Braces will make the teeth look neat and straight, and can improve the mechanical functioning so the jaw can move without issues. Home of dental office bleaching can whiten teeth. The right shade of tooth will improve the appearance of the individual. Healthy teeth and gums make all the difference to our health and our appearance. And there’s no downside to having a healthier mouth. There are many causes of toothache. It is always a symptom of a problem/ toothache require professional treatment, or at least professional advice. While proper cleaning and good health goes a long way to preventing the problems that cause toothache even the most diligent brusher may suffer the occasional problems. Toothaches come in many forms, though none of them are pleasant. Some aches are mild, some are so severe that they prevent the individual from being able to adequately function. The pain of a toothache may be intermittent, or continuous. It may throb, or it may only occur with hot or cold temperatures (sensitive tooth). Else the paint may only occur under physical pressure. Sometimes it is difficult to tell exactly where the pain is coming from. It might be the tooth or gum, or even deeper inside the jaw. Any toothache pain is most likely felt in the soft pulp of a tooth’s insides, though gums and jaws might also cause similar pain. Tooth Decay – if decay breaks down the outer tooth’s enamel, forming a cavity, then the tooth’s inner nerve will be exposed and cause pain. This will require at least a filling. If the pulp in the tooth is inflected than a root canal treatment will also be necessary. Cracked tooth- A tooth can become cracked because of an accidental impact, or from very cold temperatures. This will cause a pain when chewing or biting. A cracked tooth is very prone to decay because it is difficult to clean. Thin enamel – If the enamel of a tooth has grown thin, either from over-brushing or exposure to acidic liquids, then it will be sensitive to hot and cold temperatures. Some toothpastes will greatly reduce the sensitivity of teeth. But these take a week or more to be fully effective. Always consult the dentist about sensitive teeth. An abscess – This is a serious infection either in the gum or tooth. It requires serious dental treatment lest is lead to bone and tooth lose. Wisdom teeth are notorious for not emerging properly. A wisdom tooth that is partly or fully buried in the gum will often be painful. These teeth are often removed. Sinus problems can cause an ache that feels like a toothache in the upper jaw. While this pain is real it is one of the few dental pains that is not too serious. If the sinus problem (perhaps just the flu) clear up the pain in the upper teeth will disappear. Talk to a doctor if this continues for more than a day or two. Damaged filling- a former filling can be painful if the tooth suffers more decay. The dentist will need to fix the filling, and the patient will need to take more thorough cleaning measures. Teeth grinding can cause problems by steadily wearing away teeth. This can make the teeth very sensitive. Jaw alignment problems can cause problem pain, especially if the misalignment causes the individual trouble when chewing or speaking. This may require long term orthodontic treatment. The idea of cosmetic Dentistry is slightly misleading. As the name suggests it is about appearances. But appearances and functionality tend to be closely tied together. In most cases improving the function of the teeth and jaws leads to a better physical appearances. 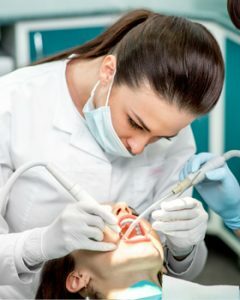 And where the dentist does a purely cosmetic procedure it is because the optimal functionality and health of the teeth has already been achieved. Teeth whitening is one of the few examples of a purely cosmetic procedure. It lightens and whitens the teeth to make them look better, and perhaps match the patient’s skin tone. The one health advantage of white teeth is with cleaning; it is easy to see if white teeth and clean or not. Implants replace a lost or badly damaged tooth. While almost everybody agrees that a natural healthy tooth is the best option an implant is so close to the natural tooth the patient soon forgets that the implant is artificial. Modern implants are made from lithium desilicate or zirconia. These are both extremely strong, and lithium disilicate (almost always used for front teeth) looks realistic and natural. Cosmetically an implant look better than a missing tooth. Braces are the best example of combining functionality with improved appearances. Braces are about neatly aligning teeth and jaws. The aim is to produce a set of teeth that neatly fit together. This makes chewing and speaking much easier. It almost always means a noticeable improvement in the appearance of the teeth. Modern options, like ceramic braces, are less conspicuous that old models. Braces during our teenage years mean straight teeth during our adult years, though diligent cleaning is important. Adults who suffer tooth alignment problems may have them corrected with invisalign. These are a series of clear retainers that can alter the position of the teeth. They cannot correct all the dental problems that braces can, but they work very effectively for most minor to moderate alignment issues. Invisalign, being clear, is not very noticeable. There was a lot of concern a few years ago over mouthwash causing oral cancer. This was very misleading. It was only the mouthwash containing alcohol that was under suspicion. Mouthwash containing alcohol may raise the risk of oral cancer. The concern is over the heavy exposure. The mouthwashes would contain 25-40% alcohol, and individuals would gargle this for a full minute three times per day. This is a high amount of alcohol exposure. Realistically, when people do use mouthwash it is gargled twice per day for half a minute. This level of alcohol exposure is a little high, but probably not too bad. However, alcohol will tend to dry out the mouth, and this is bad for teeth and breath. Ironically the mouthwash can cause the very problems that it is supposed to remove. It is best to avoid alcohol mouthwashes. Really, it is now easy to buy alcohol free mouthwashes, including most good quality, brand names. These can be used two or three times daily, and you teeth, not to mention you breathe, will be noticeably improved. There are a few different types of mouthwash, designed to treat different dental concerns. This is the most common type. It does a decent job of killing off germs and bacteria, especially if you have already brushed you teeth, and it gives you fresh breath. These are very good for sensitive or slightly damaged teeth. If the outer tooth enamel is damaged be de-calcification then the fluoride in these mouthwashes will reverse the process. It takes a few week to feel the benefits, but these mouthwashes can stop decay from getting worse, and reverse the process if we start using them early on. Basically just to freshen breath. It would be better to use an antiseptic mouthwash if we are already quite healthy, or a specialized mouthwash if we have a specific problems. Mouthwashes with all natural, non-chemical ingredients. Their effectiveness varies. Patients with gum disease may be given a prescription for an extremely strong mouthwash that fights infections. This will only be used for a short period, until the infection is removed. Mouthwash is of particular use to those of us still wearing braces as regular brushing and flossing is difficult with braces. Mouthwash, adds that extra bit of protection. We recommend interdental brushes or Waterpik when teeth with braces. Dental implants are a more modern method of replacing a missing or badly damaged tooth. And recent advances in material have made implants even better. Older methods or replacing a tooth included a dental bridge. This supported an artificial tooth between two healthy teeth. Unfortunately, this meant heavily modifying the healthy teeth, which seemed a great pity. Implants consist of an artificial tooth attached to a titanium post that is embedded in the jaw. This is an excellent replacement for a natural tooth. Titanium is used for the post because this metal has a unique property – it bonds to the jawbone of the patient. This bonding is termed osseointegration. It produces a very strong connection at a biological level. Osseointegrated implanted teeth last for many years. Older implants were made of porcelain. These provided fairly realistic looking teeth. But technology has improved on this. Newer implants are made from either lithium disilicate or zirconia. These have proved stronger than older porcelain implants, and have other advantages. Lithium Disilicate looks very like a natural tooth, and is stronger than porcelain. It is used for teeth at the front of the mouth. Zirconia is even stronger than lithium disilicate, though it is less realistic looking than other materials. It is used for the back molars where the extra strength is an advantage. A dental implant will require a few dental visits. But the results are impressive. Dental implants will only require the same diligent cleaning required of regular teeth. Though a dental implant is immune to decay the surrounding gum is still prone to infection, so the implant must cleaned on a twice daily basis. Bad breath will compromise our social life. It is also an indication of something wrong with our mouth or with some other part of our digestive system. Quite possibly bad breath is a symptom of tooth decay, or a symptom of something that can cause tooth decay. It is important to remove the cause of the breath problems before it leads to serious damage to teeth or our health in general. The first thing to look at with breath problems is basic dental hygiene. Brushing twice daily is essential. Individuals should also Floss and use mouthwash at least one per day. Using mouthwash more frequently is a good idea if the bad breath continues. Smoking will almost always cause bad breath. It is always healthier to quit smoking. If the bad breath persist there may be a diet problem. Try removing strong food from the diet, like garlic, onions and spicy foods. These do have general health benefits, but they may also cause bad breath. Else, coffee causes breath problems for some people. Some people find that processed / frozen food cause bad breath, and perhaps associated stomach unrest. Try eating more natural foods. Atkins Diet – High carb diets can cause bad breath. This type of bad breath is not harmful, but it can be socially awkward. Bad breath can be caused by bad bacteria in the mouth and digestive system. This is often the same bacteria that causes tooth decay, gum infections and other problems. Some good practices beyond regular brushing can help here. Green tea is good for breath and helps fight bad bacteria. Drink a few cup per day. Decaffeinated green tea is available. Chewing sugar free gum is good for freshening breath, though it can sometimes cover up the problem causing the odour. Xylitol sweetened gum is the best option. Chew some parsley to freshen breath. Eat some foods with healthy bacteria to help digestion and mouth bacteria. Kimchi (Korea), sauerkraut (Germany), probiotic drinks and yogurt are all good for health bacteria. Cashew nuts help fight some forms of bad bacteria. They are high in calories, but otherwise healthy. Breath mints can remove the bad breath, but use a sugar free variety. And make sure the underlying cause of the bad breath isn’t a health threat. Just eating more healthy fruit and vegetables can help with our breath. Bad breath could be a sign of a serious dental problem. 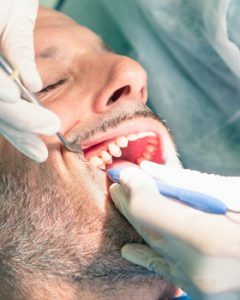 Gum disease like periodontitis will cause bad breath, this needs to be treated by the dentist as it will quickly lead to serious problems like tooth loss. An Abscess will cause bad breath. This also need to be treated by a dentist. Untreated abscesses will lead to even more serious problems. Mouth breathing, especially at night, will lead to dry teeth and gums. This will often lead to bad breath, or at least make the problem worse. Dentist can provide mouthguards to facilitate better breathing. Have any persistent breath problems checked by the dentist. Diligent Brushing, Flossing and use of Mouthwash is essential for healthy teeth. But we can also help keep our teeth healthy with the right diet and good habits. Apples, carrots, celery and other fruit and vegetables will teeth clean. The physical action of chewing these foods will get rid of some plaque from the tooth surface. They also keep the mouth moist, which reduced decay. This generation has been taught the importance of keeping well hydrated for good health. Drinking water also helps keep our mouth clean and breath reasonably fresh. A dry mouth is prone to decay because the bacteria count increases, and this is one reason for bad breath. Bottled water does not usually contain fluoride, which is a slight issue. Fluoride in tap water helps to reduce decay. Make sure to take some salt. Too much water can leave our body without sufficient salt, which is a serious health problem, leading to fainting and disorientation. Water with additives like lemon juice is too acidic for teeth. We should breathe through our nose. Breathing through the mouth leads to dry teeth and gums, and that increases the risk of tooth decay and bad breath. It also tend to make us feel lethargic due to the reduced nitric oxide. Some people find this is a big problem at night, especailly if there is snoring. A mouthguard or nasal strip can help. Talk to the dentist. Chewing sugar free gum keeps our mouth moist and helps clean out teeth. It is also good for fresh breath. Gum that is sweetened with xylitol is preferable as the xylitol helps fight bad bacteria. Gum that is sweetened with aspartame is popular with many people, though aspartame is a common allergy. Cashews have been found to fight the most common decay causing bacteria in the mouth. A few cashews after a meal is a healthy option, though these nuts do contain a lot of calories. This has many general health benefits, fighting bacteria in the mouth and keeping breath fresh are only two dental benefits. Cold green tea (in place of water) is a good option. Dental implants are the modern way to replace a missing tooth. Unlike dentures they are permanently attached to the mouth. Unlike bridges it does not require the neighbouring teeth to be altered. Dental implants consist of a titanium post embedded in the jaw holding a porcelain replica of a tooth. Titanium is used in the post because this particular metal bonds to the jawbone through a process called osseointegration. The porcelain is used because it looks like a natural tooth; the dentist can even ensure that the shade of the tooth matches the surrounding teeth. Implants usually require three dental visits. The titanium implant must be fixed during an earlier visit. The porcelain crown is attached when the titanium post has been certified as stable. Implant surgery can be performed with local anaesthetic, and will cause only slight discomfort after the surgery is completed. Success rate is very high, and even higher if there is no former damaged to the jawbone. Implants basically require the same cleaning and maintenance as regular teeth. Of course the porcelain will not decay, but the surrounding tissue and bone is as prone to infection as the rest of the mouth. Almost one third of our tooth surface lies between the teeth. We can easily clean the front, back and tops of teeth with brushing, something we should be diligent about. But cleaning between the teeth is a little more challenging. Flossing is one option. Dental floss has recently been subjected to some media questioning. A few claim it offers little if any benefit. Others claim it is an improvement over brushing alone. But most agree that is will not cause any harm under any reasonable conditions. Flossing seems to help prevent gum infections, amid other benefits, because the floss can clean the gum line space where the tooth and gum join. If a gum is already infected the floss can cause bleeding. But consistent brushing and flossing should prevent this situation from occurring. Interdental brushes are quite useful for cleaning between teeth. They are especially suited to the larger spaces between back molar teeth. Floss is better suited to getting between the smaller spaces of front teeth. Waterpik is an alternative to flossing. These electronic devices, also called oral irrigators, use a high pressure stream of water to clean small spaces between teeth. The manufacture’s claim such cleaning techniques are twice as effective as flossing. Waterpik and other oral irrigators seem to work quite well, and they won’t cause bleeding. They are a good alternative when the individual is wearing braces, which make flossing difficult. The down side is that some find that the large amount of water in the mouth to be rather inconvenient. Airfloss is a newer technology. It cleans the spaces between teeth with a burst of moist air. It appears to be reasonably effective, and less messy that water cleaning methods, but waterpik seems to do the better job of cleaning teeth. Gargling and rinsing will remove at least some of the plaque and debris between teeth. We recommend a good non-alcoholic mouthwash for this purpose. Flossing or an alternate method should be used for cleaning between the teeth.